Existing tyre models have inherent drawbacks. Some existing tyre models, such as the Pacejka magic formula tyre model, are based solely on experimental data. Alternatives, such as finite element models, are extremely resource intensive, while other tyre models represent the tyre with a physical object, such as a string or brush. None of these models achieve a balance of accuracy and efficiency. However, researchers at the University of Waterloo are taking a new approach to tyre modeling with the ultimate goal of achieving this balance. The research team, led by Dr. John McPhee, Professor of Systems Design Engineering, and Dr. Joydeep Banerjee, Lead Researcher, used Maplesoft’s system-levelling modeling tool, MapleSim, to develop and test a volumetric tyre model. Using Maple, Maplesoft’s advanced computation engine, the symbolic expressions for the normal force and rolling resistance were derived as a function of the position and orientation of the tyre. The distributed friction forces were symbolically integrated over the tyre contact patch to calculate the traction forces and self-aligning moments. The researchers then used MapleSim to develop the model using custom components derived from the Maple expressions. To test the accuracy of the volumetric tyre model, the model was used in a simulated drop test. An actual drop test was performed on a MICHELIN 195/65 R15 summer tyre inflated to 33psi. The tyre model was assembled to undergo the same motion as the actual drop test. Using MapleSim, the drop and rebound of the tyre were simulated. Another commercially available tyre model, selected from MapleSim’s extensive Tyre Library, was also used to compare the results. When comparing the results of the two models, the MapleSim volumetric tyre model provided a slightly more accurate estimate for the position of the wheel. Initial results indicate that the MapleSim volumetric tyre model is promising for use, not only for automobile tyres, but for tyres with higher camber angles, such as bicycle and motorcycle tyres. 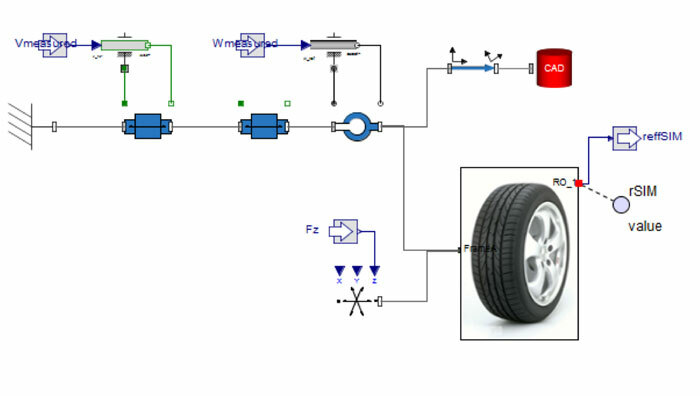 To increase the fidelity of the model, the researchers plan on further testing of the volumetric tyre model using data obtained from a Vehicle Measurement System (VMS). The VMS will provide information on the position, orientation and loads placed on the tyre during actual driving tests of a vehicle.